We also recommend that if you have any of the following credentials, then consider taking this course. Students can buy CE credits certificate for this course at the time of registration. You will receive 2 CE credits for this course through Approved Provider of California Board of Registered Nursing after completing the course. To understand how you can use the CHPA logo and certificate to help grow in your career, visit this page of How to use HIPAA logo and certificate to your benefit. You are tested after you complete the full online course. You need to pass the 12 questions test (6 questions per chapter) with 70% to receive the HIPAA Certification of Certified HIPAA Privacy Associate (CHPA). This test is for 20 minutes only. Ten minutes per chapter are allotted to answer six. Once you start the test you cannot stop it. This is a time bound online test. You can take the test from anywhere and at any time. There is no need to schedule for the test. Once you start the test, you need to finish it in allotted time. If you need the timeline allotted per chapter then test will stop right there. Once you pass your test you can print out your certification immediately but if you do fail you will have to pay $75 to retake CHPA test. If you fail in the first attempt then you can take the second attempt without any waiting period. You will be testing the sections in which you failed only. After you complete the exam, the grade will be calculated based on the total score of all exams chapters. 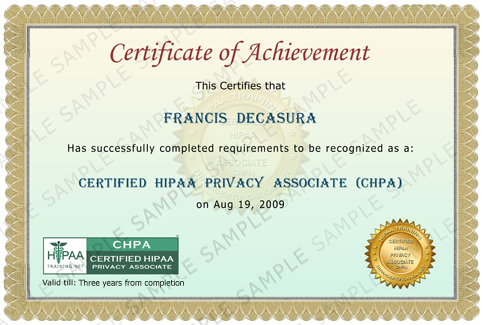 In case you want to renew your CERTIFIED HIPAA PRIVACY ASSOCIATE (CHPA) certificate, you will need to go through the CHPA Course. You are NOT required to take the exam after the training. After you complete the training, send email to Mike@hipaatraining.net requesting for your new certificate. To place the order, you can visit our shopping cart at http://www.supremusstore.com/Online_HIPAA_Overview_Training_p/chpa_course.htm In comment section of order page, mention order for 3 years CHPA certificate extension. If you have paid $99 for certificate extension then please email us back with your order number. HIPAA Overview Training – CHPA course is rated 4.4 out of 5 by 1896 users.